Montana fly fishing differs from other types of fishing in a number of ways, and casting is one of them. This is mainly due to the fact that fly fishing flies are not weighted like traditional fishing bait. Feel free to continue reading if you would like to learn about a few types of casting tips for fly fishing. If you have never used fly fishing gear before but you have been fishing in other capacities, forget what you already know about casting. Since the bait that is cast in traditional fishing is weighted, it can easily follow the trajectory of your rod and reach great distances into the water. While your fly will also follow the trajectory of your rod, the physics behind the process, and thus the method that must be used, is different. In order to perform a successful cast you must properly load your rod. There are several different analogies that are typically used to teach people how to cast this way, including the apple and the stick as well as the hammer and nail. Your cast should be short and curved, accelerating towards the target and then stopping in one fluid motion. It is this acceleration that drives the fly out into the water. The most common fly fishing grip involves a basic grasp in which you place your thumb on the top of the grip; remember to keep your grip relatively loose and make sure that you are comfortable. 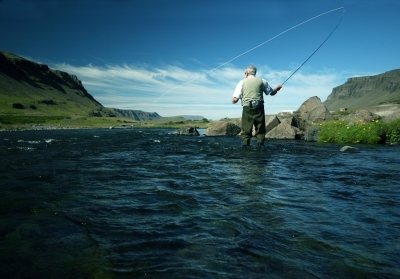 If you are attempting a long distance cast, it may help to step forward with one foot; however, you are usually safe with a parallel stance for other occasions. Keep your feet below your shoulders and refrain from squeezing the grip too tightly until it is time to unload the fly. There are many pieces of advice that Smith River fishing experts can give you on your casting; however, the best way to improve is with practice. It is important to practice as often as possible and in as many different conditions as you can in order to develop into a well rounded fly fisherman.